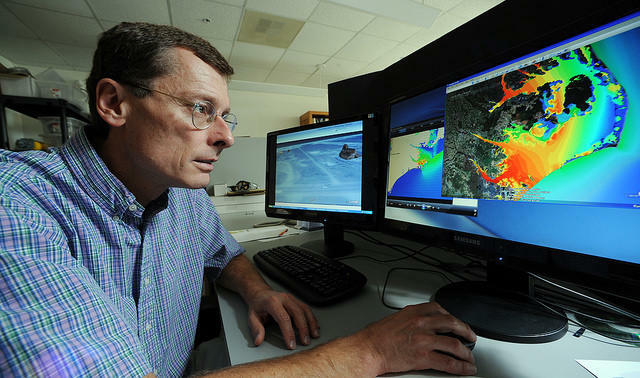 Dr. Rick Leuttich, director of the UNC Institute of Marine Sciences and the UNC Center for Natural Hazards and Disasters, uses computer modeling to predict storm surge from hurricanes and the areas effected. Predicting the frequency and severity of coastal storms isn’t an exact science. 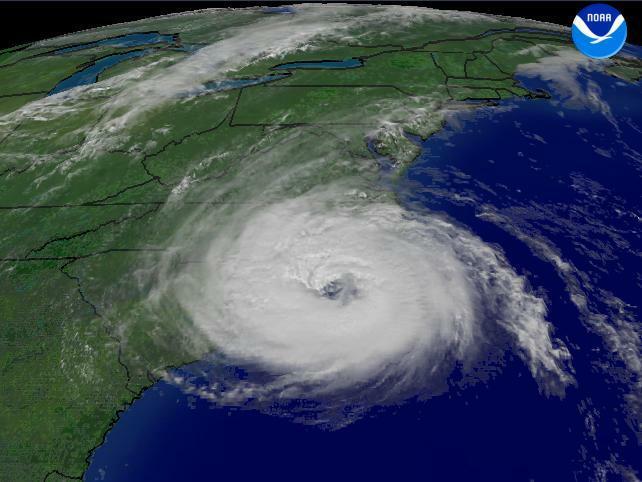 But a new North Carolina based partnership is seeking to better predict and mitigate impacts from hurricanes and tropical storms. Public Radio East’s Jared Brumbaugh has more. The Coastal Resilience Center of Excellence brings together university students and professors, the Department of Homeland Security and other federal agencies, private sector partners, and the first responder community to work collaboratively. Rick Luettich is the director of the University of North Carolina’s Institute of Marine Sciences in Morehead City and Principle Investigator for the Coastal Resilience Center of Excellence. In April, the U.S. Department of Homeland Security awarded a $20 million grant over five years to fund the Center. While it’s still in the very early stages, one of the goals of the program seeks to improve the predictability of hazardous conditions, such as flooding and storm surge. Luettich was among a team of researchers who spent twenty years developing a computer model for predicting how the ocean moves. And since 2000, they’ve been using the technology, called ADCIRC, to determine the impact of storm surge. 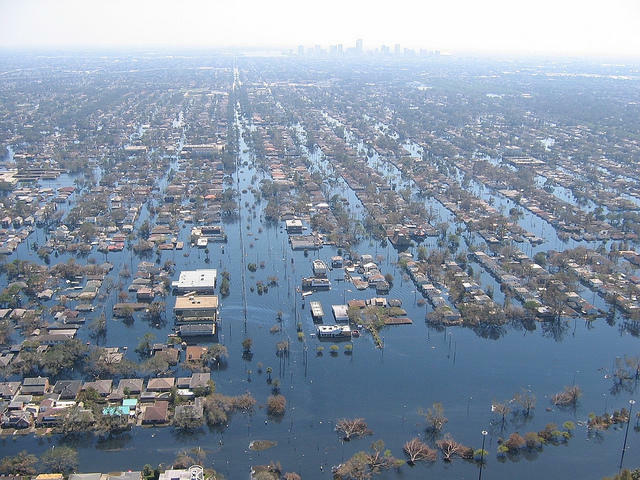 Views of inundated areas in New Orleans following breaking of the levees surrounding the city as the result of Hurricane Katrina. September 11, 2005. ADCIRC was used by the Army Corp of Engineers following Hurricane Katrina to design and improve the levee protection system around New Orleans. It was also used by the National Flood Insurance Program to re-evaluate coastal hazard maps from New England to Texas. In North Carolina, ADCIRC is run twice a day to forecast storm surge and flooding associated with upcoming weather events. Luettich says another area of the Coastal Resilience Center of Excellence will focus on how individuals and governmental organizations respond before and after natural hazards. Luettich says the Center makes the ADCIRC storm surge model available to community leaders for planning purposes. Another goal of the Coastal Resilience Center of Excellence is educating young scholars and professionals working on the ever changing subject of coastal hazards. The new Coastal Resilience Center of Excellence received an initial $3 million grant for its first operating year. A planning meeting is set for the end of July in Washington D.C. with the hope to involve officials at multiple levels of government at that time. The Center will be fully operational in early 2016, where they will begin to work with officials in North Carolina and other states. According to the Department of Homeland Security, the move expands on existing efforts by the Coastal Hazards Center of Excellence, which was formed in 2008. The Coastal Hazards COE informed the U.S. Coast Guard on operation decisions related to staging ahead of Hurricane Sandy.